Maura Fahy of Fahy Travel accepts the award for ITAA Travel Agent of the Year from Miriam O' Callaghan at a ceremony at the Mansion House in Dublin. Also pictured are Fahy Travel employees, Caroline O'Toole, and Clodagh Connolly. 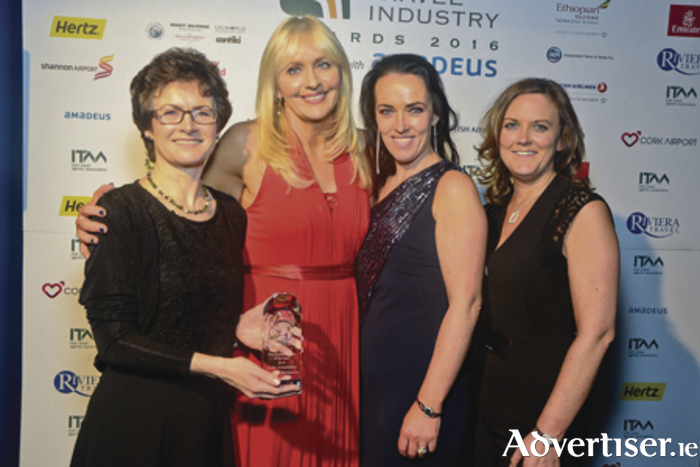 Fahy Travel Worldchoice hs scooped a prestigious travel award after being named as the ITAA Travel Agent of the Year at the Irish Travel Industry Awards. The ITAA was founded in 1971 and, since then, has represented Ireland’s Travel Agents and Tour Operators. The association brings together approximately 100 member companies covering 140 branches throughout Ireland. The awards are the premier accolade for suppliers and travel agents, and are designed to showcase excellence in the delivery of international travel services to both leisure and business customers travelling from Ireland. Speaking to the Galway Advertiser, Maura Fahy of Fahy Travel was understandably delighted. "It is wonderful to bring such a prestigious award to Galway. This is an indictment of our outstanding customer service, first-rate expertise and the wide range of travel options available to our customers. It basicially means we are doing things right, and doing things well. We have been shortlisted for the past number of years, but to win is amazing. It is a great recognition within the trade as the panel of independent judges are all connected to the travel industry." Maura Fahy says she believes the opening of Fahy Travel's Cruise Shop was ultimately what secured the company the award. "I think our cruise shop was what brought us over the line. It is a very innovative idea and cruising has become so popular. It is a very complex product which people need assistance with. Indeed any holiday that requires more than one stop is virtually impossible to book on-line. Something else many people do not think about is the security of their money - until something goes wrong. If a flight is cancelled we have a guarantee being fully licensed and bonded." The travel agent says the company is well-known for being able to provide expert advice, but also matching the price of the internet and in many cases beating it. "I would say to anyone, to give us a call and find out for yourself."